In some schools, teachers are told which form to teach (D’Nealian and Zane-Bloser are the most common current styles) with older teachers remembering and knowing the Palmer method. If no one is mandating which style you teach, then which style should you choose? The short answer is, it doesn’t matter. Choose whichever style you like personally. If you are unfamiliar with different cursive styles, here is a great page which shows many different styles, and lists them by name (most of which have only slight differences). If you have school materials and desk tapes in a given style, stick to the style (because if you teach it differently from a wall chart or desk tape it will confuse the students). If you have no materials, it really doesn’t matter even if you slightly mix styles. If you don’t like one particular letter in a style (for example, I don’t like the capital W’s with rounded bottoms), then substitute a different style for that letter in your own cursive worksheets. Choose the letter styles you like, and practice them until you feel you can make them really well (including on the chalk board or white board while writing in front of students). D’Nealian adds tails at the end of each letter which connect to the following. Traditional cursive methods instead add a lead-in stroke to each letter, which connects from the previous letter. The problems I’ve encountered with D’Nealian are with correct letter formation. Because students being taught in manuscript (the D’Nealian slanted printing style) usually don’t get the slant right (because their teachers haven’t insisted they turn their books and papers since Kindergarten), what usually happens is that the students write vertically with big tails (which is all wrong). Thus, all the small l’s with tails look like capital L’s right in the middle of words. This is only one of the many problems I’ve found with D’Nealian. It’s much easier (in my opinion) to get the correct slant by learning other traditional methods of cursive. In any case, teaching correct slant and turning of the paper will be dealt with in a subsequent post. The next post will deal with writing the cursive masters. This entry was posted on September 7, 2011 at 7:47 am and is filed under Alaska, American Culture, Australia, Bahrain, Bangladesh, Brazil, Britain, Canada, Chile, Colombia, Costa Rica, Cursive, Dubai, Ecuador, Education, Elementary Education, England, France, Germany, Greece, Handwriting, Hawaii, Home Schooling, Hong Kong, India, Indonesia, Ireland, Israel, Italy, Japan, Jordan, Korea, Macau, Malaysia, Mexico, New Zealand, Pakistan, Paraguay, Parenting, Penmanship, Portugal, Russia, Saudi Arabia, Schools, Singapore, South Africa, Spain, Students, Teacher Preparation, Teachers, Teaching Cursive Handwriting, Thailand, Turkey, UK, Ukraine, Uruguay, Venezuela, Vietnam, Wales. You can follow any responses to this entry through the RSS 2.0 feed. You can leave a response, or trackback from your own site. Hi, I can’t thank you enough for these helpful tips, insights & graphic comparisons. My child has just transferred to a new school for 1st grade, and is now having to adjust to the Montessori method as well as having to catch up with cursive, which was not taught at her (non-Montessori) preschool. A few months ago, I bought her a children’s cursive writing workbook from the bookstore, naively assuming, until recently, that a single standard cursive style was being taught everywhere. It was only when the school sent home some worksheets that I realized they were teaching a different style, which I now know is Zaner-Bloser, thanks to your blog. The workbook I had bought turns out to be Palmer-based, and my daughter is now confused as to why the capitals start with ‘extra loops’. Well, though I like the graceful look of Palmer, I realize it would be wiser to go with her school’s choice of Zaner-Bloser. But I will now read the rest of your blog, and hopefully I’ll learn enough to make my daughter’s experience with cursive a more enjoyable one. Thank you for your comment. I never finished my cursive series, and your post has inspired me that there are people still out there needing this information. You’ve inspired me to continue, so I will see about finishing the series (probably 20+ parts) to help teachers/parents/learners through the small problems that arise in mastering cursive which never seem to be explained in those workbooks! This is actually a very interesting read! I’m currently studying to become an elementary school teacher here in the Netherlands and writing cursive (and teaching to write cursive) is one of the basic skills we have to learn. I became interested in handwriting in the United States because of the worksheets with print letters I saw on Pinterest. (like these: http://wildaboutteaching10.blogspot.nl/2012/02/handwriting-galore.html) I questioned if children didn’t need to learn cursive handwriting in other countries. I’m surprised how much countries differ in teaching handwriting! I’m about to start “Cursive Club” as an afterschool activity for kids who want to learn cursive since it isn’t taught during their regular school day. These first few posts have been really helpful and I would be super excited if you decided to continue the series! Wow, how fun! And what a positive way to do it. I will think about continuing the series. I realize this post is a bit old, so hopefully if you have time you can help me out! Have you heard of Logic of English? They created a cursive font similar to D’Nealian, however when I try to find differences, they both look similar EXCEPT in the D’Nealian cursive chart you included in your post. Logic of English begins with a lead/ “swing” into the letter, but it now looks like D’Nealian does too in all my searching… Did D’Nealian always have this, or is relatively new? Kristina, I have not heard of Logic of English. The older cursive systems all forward-slanting, and used lead-in strokes (which I thought looked really stupid when I was a child learning cursive). D’Nealian attempts to teach slanted PRINTING (which most kids actually don’t master, as it is far more difficult than vertical printing), but they usually end up getting tails on the ends of their words and letters. The reason for these tails is that D’Nealian does away with the lead-in strokes, and replaces them with tails (both systems being how the letters connect, so you need one or the other). However, having tried both, I personally think the older systems using lead-in strokes are much easier to master, and master well. I’ve looked up a few photos of “Logic of English Cursive” and from what I see, it is using the older (and better) method of using lead-in strokes (such as on the small “a” and the small “d”). 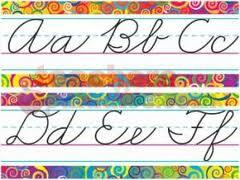 I also noticed that while it is not vertical, it is somewhat less slanted than cursive used to be taught. At this point in time, if your child is learning cursive at all, this is a benefit. The students at our school who missed out on learning cursive, and who are now moving into high school, not only can’t write cursive, but they can’t read it, either. It’s like a foreign language to them. I don’t know if D’Nealian has added lead-in strokes to cursive or not. The last cursive class I taught ended six years ago, and I am not as current with new cursive styles or changes that have recently come out as I used to be. I hope this answer helps. D’Nealian has both a printing system and a cursive system — and the cursive has lead-in strokes on every lower-case letter (see dnealian.com/samples.html). I don’t know why I keep hearing that it doesn’t; I’ve had to look at D’N cursive books, and the “non-existent” lead-ins were right there. D’Nealian always has lead-in strokes in its cursive. In fact, it even has then on letters like lower-case “a,” where Zaner-Bloser dropped them about 70 years ago. That’s why I’m very confused when some articles on handwriting styles tell me that D’N doesn’t have lead-ins, or tell me that D’N has fewer lead-in strokes than Z-B. Is there some mental “trick” that I have to learn, to stop being able to see the lead-ins in D’N? Please help. Hi. I’m trying to decide how to learn to write with my left hand. The idea is to develop the artistic side of the brain, and to be able to take notes while doing something with the right hand at the same time. Do you have tips for left hand learners? Jean, you sound like a naturally right-handed person who wants to become competent in writing with the left hand as well? I do think your idea of asking your brain to do two separate activities at the same time will probably not achieve good results. How did you come up with this particular idea for developing creativity? Vivian, thanks so much for letting me know it is helpful to you. 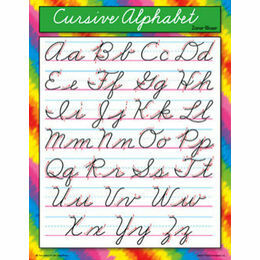 I sort of gave up on it after it appeared that nearly every school had now dropped cursive writing. I will make a point to continue the series. Meanwhile, I want to give you a precise answer to your question. The way to get a slant is to TURN THE PAPER (or notebook). Instead of having the paper directly upright in front of you, rotate it about 45° COUNTER-CLOCKWISE, so that the upper right corner is in the 12:00 position. Then write normally on the page, and the writing will have the proper slant. No one can write with a proper forward slant if the page is not turned on the desk (I still write that way to this day, as it was how I was taught, too). A helpful hint is to cut a thin strip of paper (I used to use a 1/8th-wide strip cut from red construction paper, but any paper will do) and tape it to the desk or table where your daughter is working. The bottom edge of her paper should rest on that line. As a third-grade teacher, I taped these red lines on each desk before the first day of school. (I also did it when I taught Kindergarten for three years.) How did I get the idea? My own teachers did it when I was a child. If you want to try the red line method (I suggest possibly the on her home desk, as well as on the kitchen table, if she might work in the same room as you), here is how to correctly position the paper line. Sit down at the desk yourself, and place a normal sheet of notebook or typing paper in front of you. Turn it so that the upper right corner points directly at 12:00 (with lower left corner at 6:00), but that those corner points are positioned directly in the middle of your body, and the lower point right at the edge of the table close to you. The line you tape on should be positioned just next to the lower edge of the paper, and it will be on a 45° angle. This will make it very easy when your daughter sits down at the table to know where to put her paper before she starts to write. The bottom of notebooks can be positioned right along the same line. I hope this helps! I do agree the right slant is important, as adults (especially in America) are often judged on their handwriting in employment situations–not just for neatness, but on their personality characteristics based substantially on slants! I have been referring to your posts for several years and, YES, there are those of us out here who still zealously promote the teaching of cursive! I work at a private school that believes in the academic and artistic benefits of the act of writing in cursive. If you have it in you to continue the series, there are many of us who are waiting with anticipation! I personally believe that in 10 to 15 years (if not sooner) schools and educators are going to return to cursive having watched the performance of their students deteriorate. They are going to need experts like yourself to reacquaint them with the art. Thank you! Thanks for letting me know this, and that my posts are making a difference to someone out there. I will therefore see about continuing the series (not sure exactly how soon, but yes, I will do it). Thank you for your kind and encouraging words. I always use the Palmer method since my parents taught me how to write cursive like that. I see from a subsequent post that your series on Cursive was going to resume January 2018. Did that happen? I can’t find it. Thanks. Love this information. Noel, what happened is that I got very sick with the flu two separate times, and for many weeks each time. I’m better now, but now it’s tax season. I hope to have some new articles posted around May 1. So sorry to keep you waiting. Wow! I’d LOVE to have that list!